D & D Garage Doors handles all your Garage Door needs for Fort Myers and Naples, FL. Fort Myers Garage Door Repair, Broken Springs, New Garage Door, Garage Door Opener. You name it, We can do it! 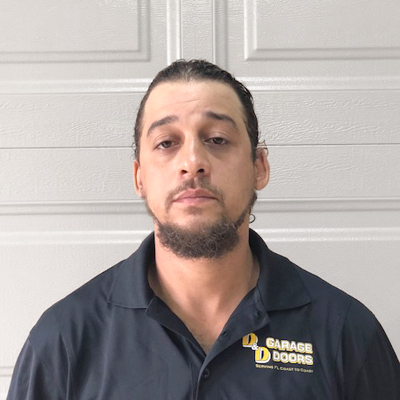 D & D Garage Doors in Fort Myers and Naples “We Handle Your Ups & Downs.” If your door won’t open and close like it should give us a call at 239-540-6888 for a Free Estimate today! Hi I’m Shirley! I have been working in sales and management with garage doors since 1998. I am originally from Cuba but moved to Florida at 3 months old and have been here ever since. I was adopted into the company when they bought Omega Garage Doors in 2010. I respect the work ethic that D & D Garage Doors represents, Customer Service is #1 priority, and that’s what makes us so successful. 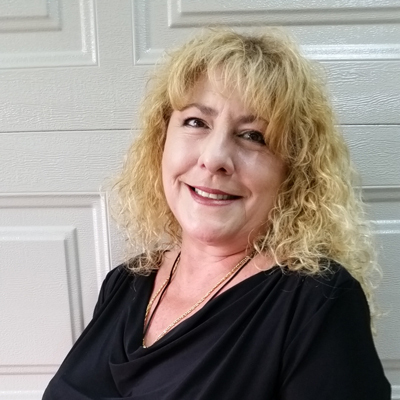 I have been in this field since 1998, so I have plenty of experience in service, scheduling, new orders, residential sales, and commercial too. I love what I do, I meet so many different people from all over the world because they all come to Southwest Florida to enjoy our beautiful weather and beaches! The most important part of my job is to make sure our homeowners and contractors are aware of all great new products available to them and are satisfied with the door and service we provide and trust our company to always be there for them. I look forward to meeting you soon. 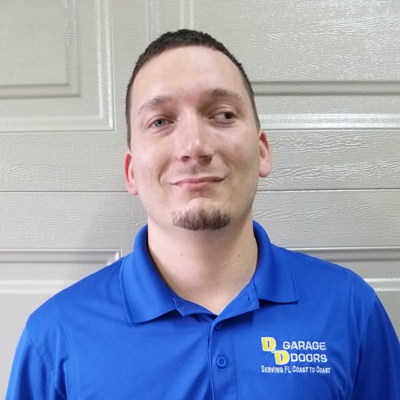 Hi i’m Matt and I work in Sales here at D & D Garage Doors Fort Myers. I’ve been working for D & D for a year and a half now. Prior to working here I worked at another Garage Door company doing service and installs, I also built custom doors as well. I was attracted to D & D because of how they treated their employees. I am originally from Boston and I moved to Florida for the weather. Something unique about me is that I was the first person in my family to finish high school and graduate college. I believe the most important part of a job is everyone doing their own work. As long as each individual is able to accomplish their own goals, the whole will be made stronger. It is the foundation that allows teamwork and cooperation, which is also very important, to be developed and strengthened. I love to generate new visitor/cliental and opportunity to work with dynamic leader. One thing that I could say about D & D Garage Doors would be it is a GREAT company to work for. 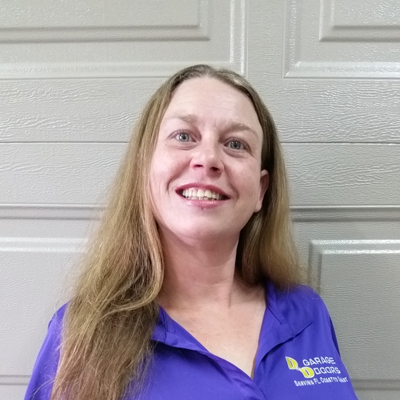 Hi my name is Laura and i’m a scheduler here at D & D Garage Doors Fort Myers! I’ve been working for D & D for a little over a year now. I have many years experience in service, sales and scheduling in new construction, overhead crane systems, air conditioning and also in outdoor advertising. Prior to coming to D & D Garage Doors I was head of the Scheduling and CSR Department at a local pest control company. 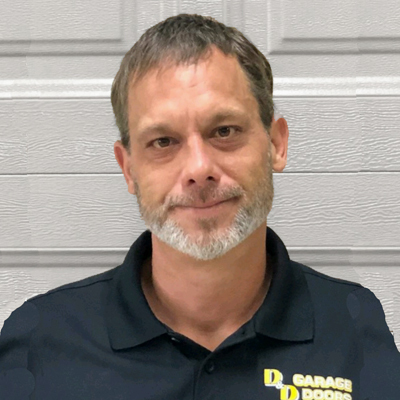 What attracted me to D & D Garage Doors was that it was a well established company, had opportunity for growth, and they care about their employees. I have stayed with the company because I love the challenge of my job and love working with the customers. I am Florida native but I am originally from Milton and then moved to Fort Myers. The most important part of my job is exceeding the expectation of our customers by being informative, educational, flexible, prompt, respectful and courteous. 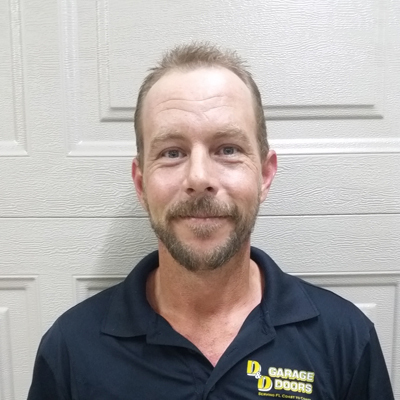 I love that I learn something new everyday while working here and if I could say one thing about D & D Garage Doors Fort Myers it would be that they stand behind their product and service, and go the extra mile to resolve all issues. 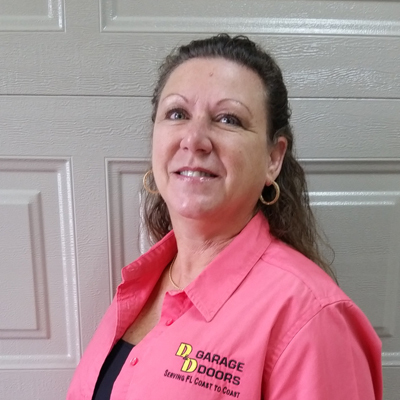 Hi my name is Jackie and I work in service and permits here at D & D Garage Doors Fort Myers. I have been working here at D & D Garage Doors for 2 years now. Prior to working here, my service background includes having 30 years experience of customer service from retail supervising to being a construction supervisor at Habitat for Humanity for 13 years. 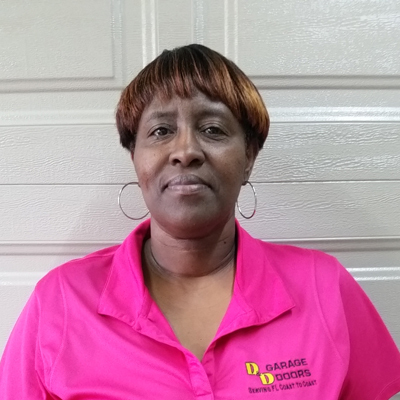 I had worked with D & D Garage Doors when I was with Habitat for Humanity and felt the experience was quite pleasant so when a job was available I applied. I’m originally from Alabama but moved to Florida when I was very young. What I feel is the most important part of my job is being able to answer questions and help the customers solve simple problems over the phone. What I love most about my job is customer satisfaction. If I could say one thing about D & D Garage Doors it would be that it’s a fun place to work with a good group of bosses and co-workers. Hi i’m Amanda and I work in the Install Department. 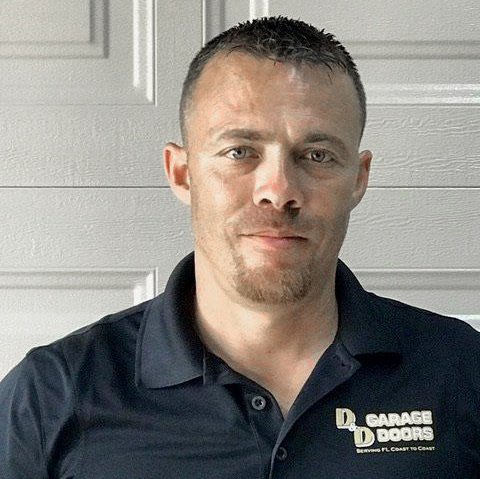 I have been working for D & D Garage Doors Fort Myers for 2 and half years now. Prior to working for D & D Garage Doors, I worked with a sub-contractor company for Comcast in the Install Department. What attracted me to D & D Garage Doors was that at the time I was looking for a job but what made me stay was how they truly care about their employees, plus the people I work with are great team players. We all help each other when needed and have become a work family. I am a true Florida Native but I grew up down near the Everglades. Something unique about myself is that I have a lot of patience and I always put others before myself. The most important part of my job is making our customers feel as though they are our number 1 priority and to make sure we complete our job leaving them happy. What I love most about my job is the people I work with and building a professional relationship with the builders. 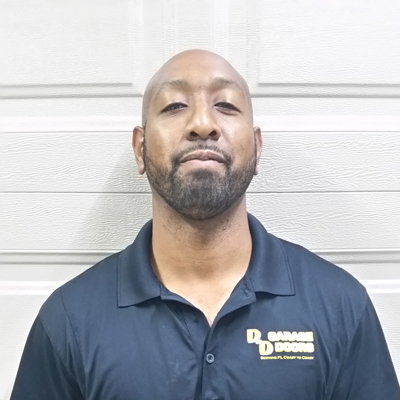 If I could say one thing about D & D Garage Doors it would be that they are dedicated to their customers and always making sure they are happy with the service D & D provides them. Hi I’m Jennifer and I handle Scheduling. 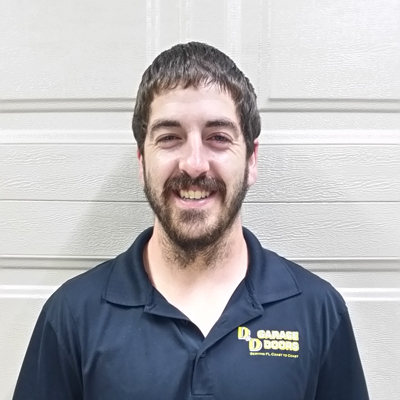 Hi my name is Shawn and I’m a Garage Door Installer at D & D Garage Doors Fort Myers. I’ve been working here for 2 years now but prior to working here I studied auto mechanics. What I liked about D & D was that this industry has plenty of work and this company has a lot of room for growth. I am a Florida native and was born and raised right here in Fort Myers! Something unique about my family is that we are all mechanically inclined. What I feel is the most important part of my job is safety and quality. What I love most about my job is getting to see the work when it’s done and knowing that I did a good job. If I could say one thing about D & D Garage Doors Fort Myers is that we know how to make it happen. 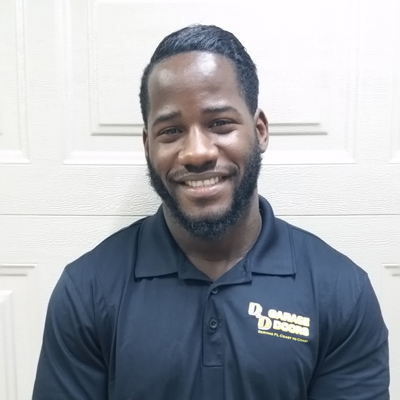 Hi i’m Reuben and i’ve been working with D & D Garage Doors Fort Myers for 3 and a half years now. 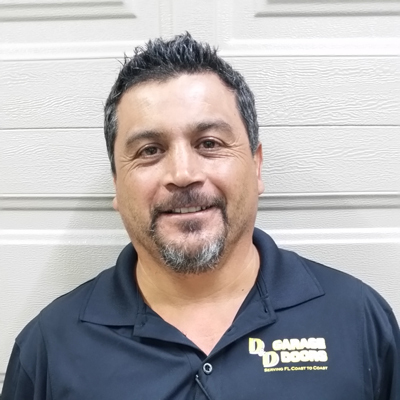 Before working for D & D Garage Doors my service background includes a combined 16 years of servicing and installing all types of garage doors, garage door operators and gate operators. 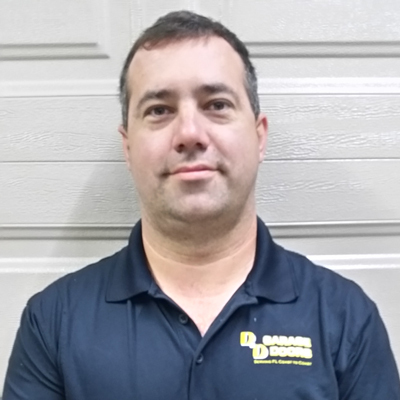 What attracted me to D & D was that I had always wanted to work for the best, it is a company that has grown into a highly-rated and highly-qualified company in the Florida door industry. I am originally from Atlanta but relocated here to be close to family. Something unique about myself is that I have a happy, blended family with six great children. What I feel is the most important part of my job is providing security and peace of mind to our customers while adding beauty to their homes. What I love most about my job is solving problems for our customers. If I could say one thing about D & D Garage Door Fort Myers it would be that I really enjoy working here because I get to work in an atmosphere that appreciates my attention to detail and strong work ethic. Hi my name is Galileo, and I have been with D & D over a year now. Before working here me and my twin brother worked for a granite company. Now that we work together again I clarify that I am the better looking & more charismatic twin. We are from the Dominican Republic and have a singing group together. D & D is a great company and offers opportunities to its employees. I just want to make sure the customer is happy. That’s when I know I’ve done my job right. My name is Nate and my twin brother, Galileo, told me about D & D, so I joined too a few months ago. Out of the 2 of us I am the stronger twin, but I also love to sing in a group with my brother. We were born in the Dominican Republic, but our family moved to Florida when we were young. Galileo and I worked at a granite company before coming to D & D, but I wanted a change of pace. I like using tools and learning new skills. It is really cool to see the finished product after an install. It feels like the reveal part of an episode on home improvement shows when the customer gets to see the new look of their house all finished. 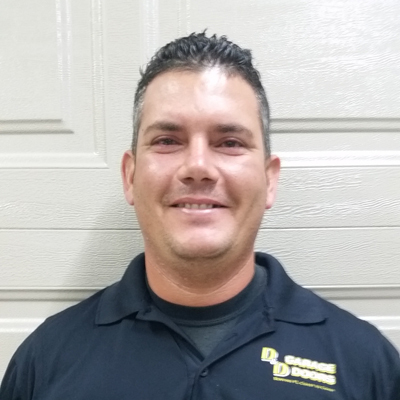 Hi my name is Mike and I have been with D & D Garage Doors Fort Myers for a year and a half now. My service background includes 10 years with low voltage systems like alarms, cameras and various sensors. What attracted me to D & D was that it was a reputable company and I like service work that involves resolving issues and meeting new people. I am originally from Alabama and moved here when I was young. The most important part of my job is resolving issues with a positive attitude. What I love most about my job is taking care of the customers and if I could say one thing about D & D Garage Doors it would be that it is the best company I have ever worked with. 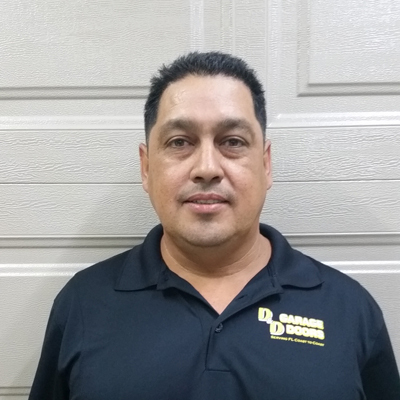 Hi I’m Luis and I am an Installer here at D & D Garage Doors Fort Myers. I have been working here for about 6 months and prior to working here my service background includes working at Walmart. The steady work attracted me to D & D Garage Doors and I like it because it keeps me busy. I am originally from Puerto Rico but came to Florida for a better opportunity for my family. Whenever I am working on a job I always make sure I am installing the garage door as perfectly as possible, I find this to be the most important part of my job. What I love about my job is the satisfaction of doing my job right and making the customers happy. If I could say one thing about D & D Garage Doors Fort Myers it would be that it is an excellent company to work for. 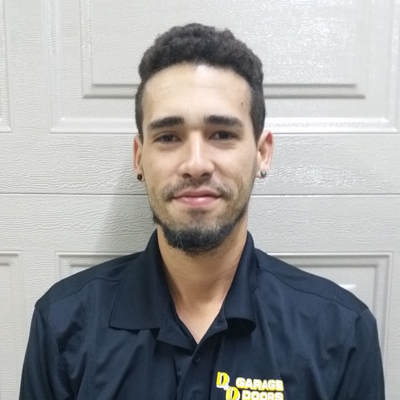 Hi my name is Alex and I have been working with D & D Garage Doors Fort Myers for a little over a year now. Before working at D & D, my service background includes being an industrial mechanic. What attracted me to D & D Garage Doors Fort Myers was that it does not set limits on its employees. I am from Honduras and what brought me here was the desire to overcome. Something unique about myself is that I am a great communicator and listener. What I think is the most important part of my job is to give my best everyday and what I love most about my job is making the customers satisfied with the job I have completed. If I could say one thing about D & D Garage Doors it would be that it is an excellent company. 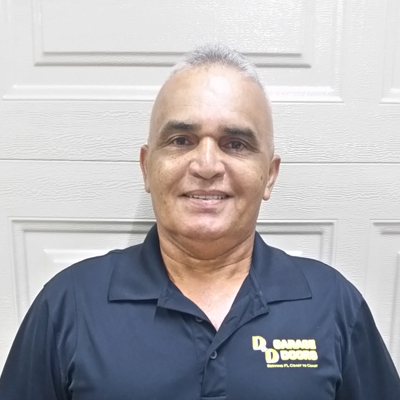 Hi my name is Ivan and I am an Installer at D & D Garage Doors Fort Myers! Before working at D & D Garage Doors for almost 3 years I was a lifeguard and paramedic. What attracted me to D & D Garage Doors was that I wanted a steady and respectable job. I am originally from Cuba and came here for a better opportunity. Family is very important to me. The most important part of my job is making customers happy and that is also what I love most about job. If I could say one thing about D & D it would be that it is incredible. Hi! 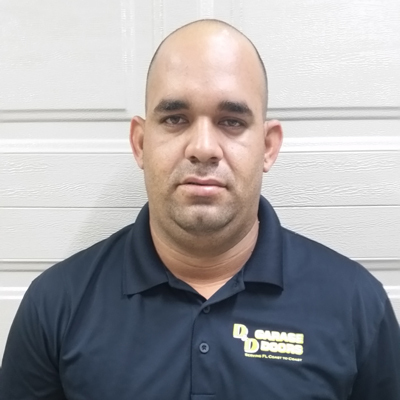 My name is Freddy and I have been with D & D Garage Doors Fort Myers for 3 years now. My service background includes owning my own business, subcontracting for Home Advisor and also working with a few garage door companies. What attracted me to D & D Garage Doors was that a friend referred me to the company and I love what I do and who I work with. I’m originally from Argentina but moved to Pennsylvania for 30 years then moved to Florida for the weather. Something unique about my family is that we are honest , we like to help people when we can , we love our each other and , we treat people the way we like to be treated . The most important part of my job is making the customers happy with our service and making them feel safe with their garage door. What I love most about my job is when customers compliment us, it makes us feel good about our job. If I could say one thing about D & D Garage Doors Fort Myers it would be that it is a great company to work for! Hello I am Endrys, and I have been at D & D less than a year. Dan G a fellow installer told me D & D Garage Doors was hiring and had steady work, so I switched from doing stucco to installing garage doors. The most important part of my job is to do a good job on my installs, which always changes the look of the house. They are a pretty good company to work for and have been a great opportunity for me and my family. 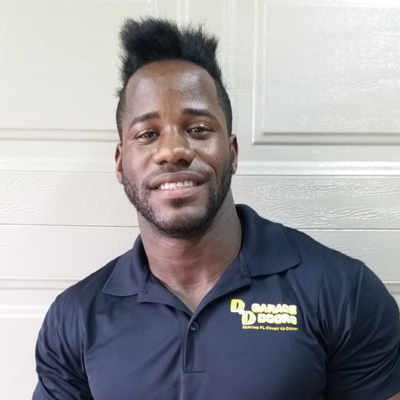 Hi i’m Doel and i’m an installer here at D & D Garage Doors Fort Myers! I have been in the garage door industry since 1986 and have been working at D & D for almost 10 years. I wanted to work here because of the way this company treats their employees. I am originally from Puerto Rico and something unique about me is I love being with my family. Being professional with the customers and finish my work on time to prevent call backs is the most important part of my job. I love learning something new everyday and also training other installers as well. D & D Garage Doors Fort Myers is a very professional company, a good organization, treats their employees well. We are the best! 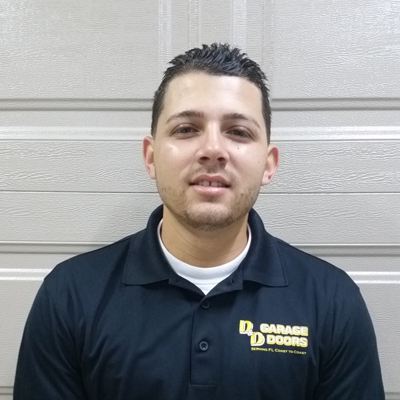 Hi my name is David and I am an Install Scheduler at D & D Garage Doors Fort Myers. I have been working here for a little over 2 years and prior to working for D & D I was an office manager for a hurricane shutter company. What attracted me to D & D was that I was looking for something different to do. I am originally from New York City and I moved down here to be with family. What I feel is the most important part of my job is trying to be efficient as possible and as error free as possible to keep our customers happy. What I love most about my job is the people I get to work with and if I could say one thing about D & D Garage Doors Fort Myers is that it is a great place to work. Hi I’m Dave and I joined D & D in late 2016 as an installer. I held several jobs before this one including a food and beverage manager, screen printer, salesman for a water purification equipment, and owner of a satellite installation business. I like to be constantly learning new things, whether that is a new ability or talent. My twin boys and I were born and raised in Florida, so I know the area well. D & D really is a family first company that sets high standards on quality workmanship and customer satisfaction. Give us a call! 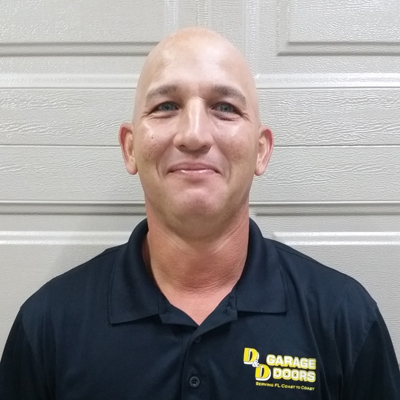 Hi i’m Dave and I’ve been working for D & D Garage Doors Fort Myers for almost 12 years now. I have a total of 26 years in the Garage Door Industry. What attracted me to D & D was that it was steady work. I am originally from New York but moved here due to my wife. Something unique about myself is that I have 4 step sons. The most important thing about my job is that making sure jobs are completed and customers needs are met. What I love most about my job is that I get to meet different people and it is very nice to hear when you and your team are told you did a good job. If I could say one thing about D & D Garage Doors Fort Myers it would be that it’s a company that tries to keep customers needs in mind, especially when it comes to schedule times. 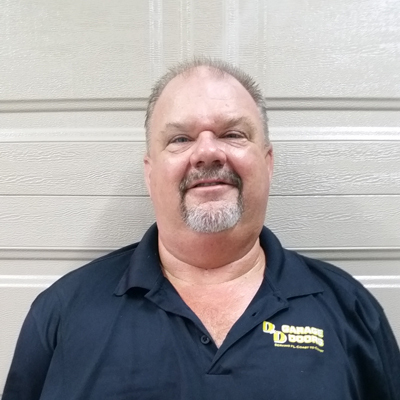 Hi I’m Dan and I am an Installer here at D & D Garage Doors Fort Myers. 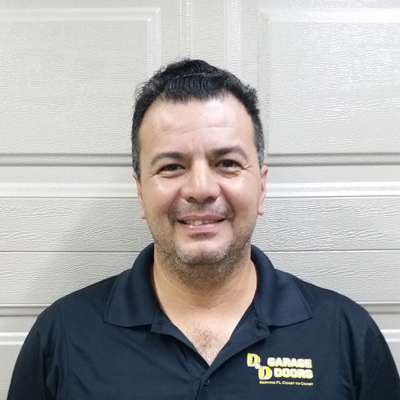 I have been working in the Garage Door business for 12 years but have spent the last 2 years at D & D. I was attracted to D & D because it was a family oriented business. I am originally from Texas but moved to Florida to be with family. What I find to be the most important part of my job is reliability and what I love most about my job is the finished product. If I could say one thing about D & D Garage Doors it would be that it is family oriented. 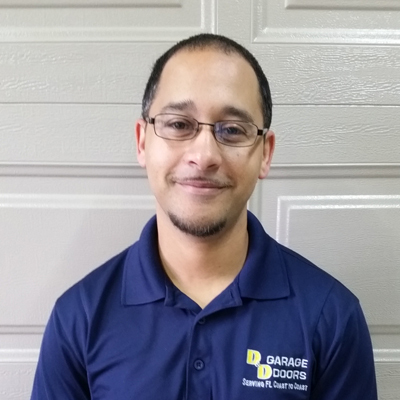 Hi I’m Louis and I work in Sales here at D & D Garage Doors Fort Myers. I’ve been working here for about 5 months and prior to working here my sales background includes a variety of different sales in the communication industry. I was attracted to D & D because I had heard it was a great company to work for. I am originally from Ohio and I moved here 25 years ago. An interesting thing about me is that I have rescued all of my dogs and all of them are German Shepherds. The most important part of my job is great communication with our customers. What I love most about my job is meeting new customers and selling them our products. If I could say one thing about D & D Garage Doors it would be that they are a great company who cares about their employees. Hi i’m Steve! 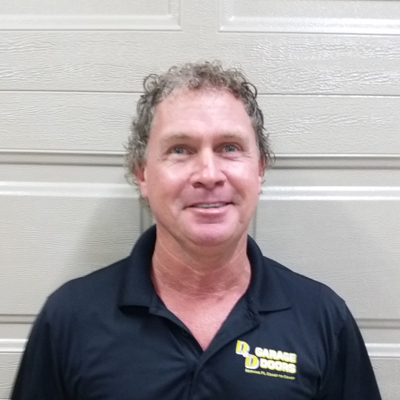 I am a Garage Door Installer here at D & D Garage Doors Fort Myers and I have been working here for 4 years. I have plenty of experience in the Garage Door industry with 16 years of installation work. I was born and raised in Florida and something unique about me is that I have 5 kids. The quality of my work is the most important part of my job. What I love most about my job is that I am knowledgeable about what I am doing since I have been doing it for so long. If I could say one thing about D & D is that it is a good company to work for. Hi I’m Stephon! I’m a Garage Door Installer here at D & D Garage Doors Fort Myers. I have been installing garage doors for over 13 years now. What attracted me to D & D was that it was a growing company and there was plenty of work. I am originally from New Jersey and I moved here to be in sunny Florida and away from the cold weather. Something unique about me is that I am raising 3 little boys that look to me as their hero. What I feel is the most important part of my job is installing the garage doors without problems. 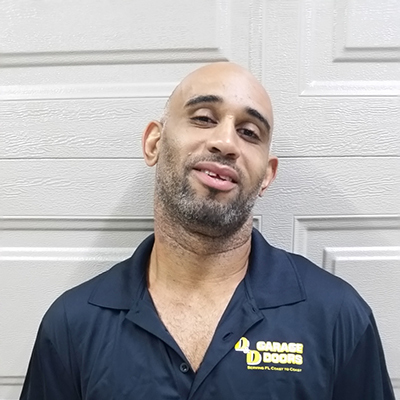 What I love most about my job is making customers happy and if I could say one thing about D & D Garage Doors Fort Myers is that it is a great place to work. 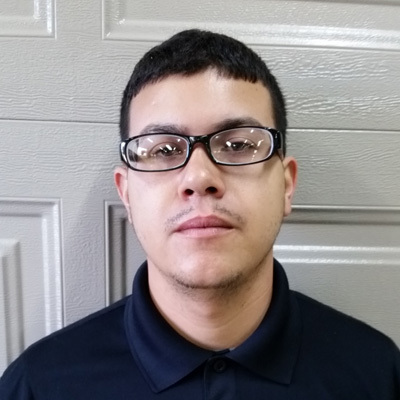 Hi my name is Luis and I work in the warehouse here at D & D Garage Doors Fort Myers. I have been working here for 6 months now and my service background includes installing insulation. Initially I was attracted to D & D to earn a better wage but I stayed here because of good group of people and I love what I do here. I am originally from Puerto Rico, what brought me here was a better opportunity for my family. The most special thing about me is my four kids and my beautiful wife, they are the most important thing in my life. I find the most important part of my job is the quality and how I treat the customers. What I love most about my job is being able to work hard during the week and enjoy my time with my family on the weekends. If I could say one thing about D & D Garage Doors it would be that we are very fast and efficient.